UKIP leader Paul Nuttall is to stand in Boston and Skegness in Lincolnshire in June’s General Election. Announcing his bid on Saturday, he said the seat voted “overwhelmingly” for Leave in the EU referendum last year. The constituency, held by the Conservatives in 2015 with UKIP second, recorded the highest Leave vote, with 75.6% choosing to leave the EU. Mr Nuttall said he would make it his “mission” to “ensure there is no backsliding on Brexit”. He had said on Friday that he would do his “duty to lead the party into battle” and stand for election, but at that time refused to confirm speculation he would stand in the Lincolnshire constituency. Mr Nuttall had been due to make a speech in Hartlepool on Saturday as part of the election campaign, but a party spokesman said it had been cancelled due to “unforeseen circumstances”. Police said two women, aged 28 and 62, were arrested on suspicion of assault after an altercation broke out as supporters of the party waited for Mr Nuttall to arrive. The party leader said: “It is a great honour and a privilege to stand for UKIP in Boston and Skegness. “The constituency voted overwhelmingly for Leave inspired in part by the massive betrayal of our fishing industry by successive governments, something that today’s Conservative Party led by Theresa May looks set to repeat. 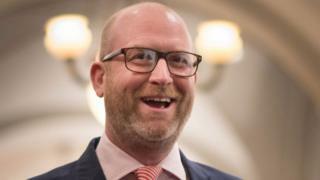 Mr Nuttall has said UKIP would be “standing in the vast majority of the country”, but that he had asked “a number” of branches to consider not standing in areas currently represented by prominent Leave campaigners from all parties, if they were at risk from a challenge by a pro-Remain candidate. His predecessor Nigel Farage would “play a front-of-house role in this election”, Mr Nuttall has said. He said he believed the party was “in with a chance of winning a number of seats at this election”. Conservative MP Matt Warman won the seat of Boston and Skegness with a majority of more than 4,000 in the last election. UKIP won 3.9m votes in 2015, which resulted in only one seat.